This post could also be titled: CSA and buying direct from local farms = a sweet deal for farmers and eaters! But stay tuned for a reason to be thankful we had all that snow…as well as being thankful it’s over! Many of our shareholders enjoyed getting frozen wild blueberries as an optional Extra at our Deep Winter Share pickups this January and February. This is thanks to the work of Lynn Thurston of Blue Sky Produce. 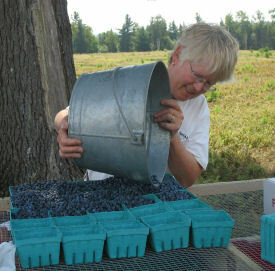 To farm stands and fresh produce markets in our area during the late summer, Lynn delivers fresh wild blueberries direct from farmers in Maine, whom she pays a great price (about 6 times what they get from a big distributor like Wyman’s). We get really great blueberries because Lynn works with the growers to ensure the highest quality in harvest and post-harvest handling. In the winter, and through till April, she delivers the blueberries frozen (but with the “bloom” still on, just as if you had picked and frozen them yourself!). Lynn is a real pleasure to work with–I always welcome our brief visits as she cheerfully drops off our order in her outfitted van and goes on to produce markets and her other accounts in the area. This year, the Maine blueberry harvest was lower and she found many Nova Scotia pesticide-free wild blueberry growers who also needed help getting their blueberries sold at a fair price. So, we’ve been getting boxes (4.4 pound boxes) of Nova Sc otia blueberries this winter. At $22/box, these are a wonderful deal. Our family has really appreciated having a steady supply of these nutritious colorful berries with our breakfasts all winter. In her recent newsletter, Lynn describes how good snow cover protects perennial food plants like blueberries from a bitter winter like this one. Here is more about Lynn in her own words. You can visit her website, too, to learn more about the Maine growers. And look for Blue Sky blueberries in local farm stands and CSAs near you. I didn’t grow up on a farm and I had a lot to learn. So after getting a taste of the produce business working at Frieda’s Specialty Produce in Los Angeles, I returned to my native “Great State of Maine” and started farming. However, I needed a job to support my farming venture, so I started brokering herbs and wholesaling fiddleheads. I enjoyed most aspects of farming (except for fixing the equipment) and grew 5-10 acres of specialty produce such as flowering kale, napa cabbage and bok choy. Unfortunately,after 15 years, I had to quit because of back problems. The experience taught me how hard it is to make a living farming and I resolved to try to help other small farmers. Meanwhile, I was always disappointed I couldn’t buy Maine Wild Blueberries at the local store. Less than 1% of wild blueberries are harvested for the fresh market because of the extra care it takes to rake and clean them. It has taken a few years to build relationships with growers, develop packaging and learn proper postharvest handling procedures. We now pick up wild blueberries from 8 different growers and distribute them to retail chains and farm stands. We hope you find some near you! ← Seeding Starts Today at Picadilly!